For those of you out there who sent out Christmas cards or letters or emails or even a did a "Merry Christmas" blog post before Christmas, I say good on ya! I have been a Christmas slacker this year, but I wish a Merry (belated) Christmas to you and yours. 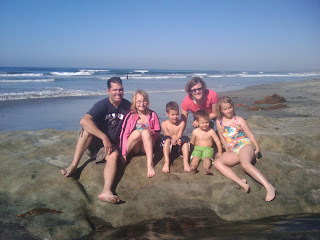 We had a fun holiday full of family and food and more food. We were lucky enough to have most of Chris's family in town and we missed the ones who live to far to come. 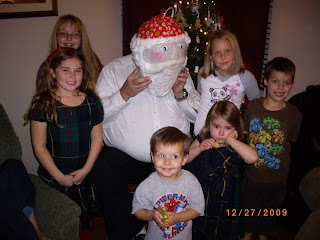 Grandma Lynne made a Santa pinata that we posed on Grandpa Hal before we busted it open. Luckily his face came through the ordeal in tact. Can I have orange jello for Christmas? I know I put a lot of Dalin quotes out there, but three year olds are hilarious! The title is his latest request for Christmas (it's his new obsession with Cloudy with a Chance of Meatballs). I told him to ask Santa. I feel like I'm kind of behind on all things Christmas, but we made an effort to bring a little Christmas yesterday. And by we I mean Chris. He's good at getting us away from doing the boring stuff like grocery shopping. We went to the Winterfest in Henderson, where we caught the tail end of the holiday parade and checked out the craft fair. 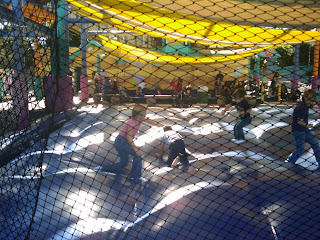 I learned later that all of the activities were free (ice skating, pony rides, petting zoo and carriage rides) but we didn't have a lot of time so we didn't do any of that. It was still nice to walk around and we found a small patch of snow on our way back to the car. 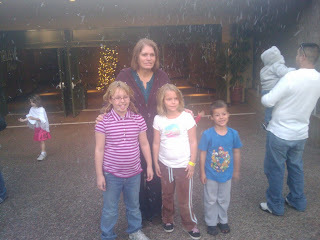 We then headed out to Boulder City for a ride on the Santa Train. It didn't go very far, maybe a couple of miles, but Santa and Mrs. Claus came through and visited with all of the kids which was pretty cute. Dalin is a little impatient when it comes to getting my attention, especially when I am driving. He doesn't quite understand that I can't turn around when I am supposed to be watching the road. A couple of days ago he kept saying "Mom look at me . Mom look at this. Mom look what I'm doing. Mom see this. Mom, mom, mom, mom, mom, mom, mom, mom." You get the idea. I was a little annoyed, and when we finally came to a stop and could turn around my "whaaaat" surely conveyed that fact. His reply? "Mom look, I'm sitting like an old man." Hi-lar-ious! Where does he come up with this stuff? Here's the old man on the train. I think it's so funny I keep making him do it. Chris's sister Emily and her son Jayden moved across the country to start their new life in New York. They were living with us for the last four months so we were pretty sad to see them go. Good luck and happiness to you guys, and come visit when you can. 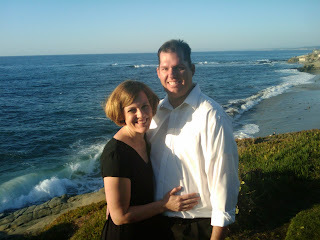 A couple of weeks ago Chris and I celebrated 12 years of wedded bliss and yes it has been mostly blissful. While we spent our actual anniversary traveling to California (see the previous post) we had two date nights in a row thanks to some great offers of babysitting from Chris's mom and my brother and sister-in-law Brian and Natalie (you guys are the best!) We went to Texas de Brazil, Chris's favorite and very tasty but still very expensive even with a buy one get one free meal coupon. We also tried to get free tickets to a UFC fight when Chris read on twitter that they were being given away just down the street from where we were. I know, how great a wife am I (I didn't even give him grief for checking twitter while we were on a date). We're not a mushy gushy kind of couple so I won't gross you out with confessions of undying love or anything, but I am a lucky girl to be married to my best friend and to still be in love with him every day. 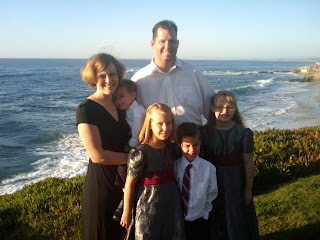 We had a pretty busy November part of which included a trip to San Diego for Chris's sister Emily's wedding. 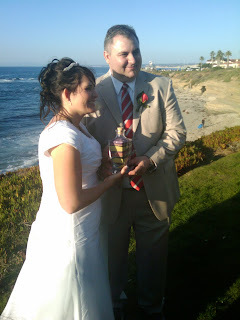 She got married on a Monday afternoon so we spent the morning at the beach. The weather was a little chilly when we left the hotel, but warmed up to beautiful pretty quickly. 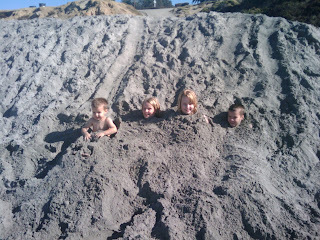 That is not to say that the water wasn't fa-ree-zing, but we thought the kids would be satisfied just playing in the sand. We were only 25% correct in our thinking. 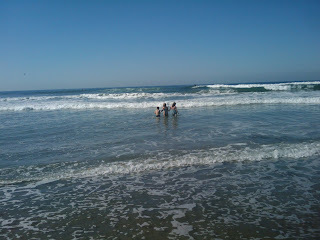 Dalin wouldn't go near the water, but the other kids headed straight for the waves. 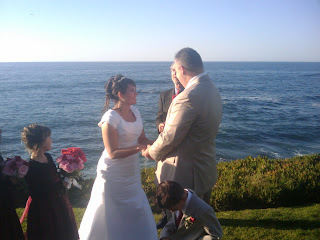 The wedding was at the beach and bride, groom and their new family all looked beautiful. Earlier in the year we bought passes to Sea World good through the end of December, so we decided to spend a couple of days there to soak up a little more San Diego sun (it's always nice to have a little tan at the end of November). Dalin and I have been having some interesting conversations lately. Actually I can't really classify them as conversations because they are so random I can barely follow. Here are a couple of examples. D: Hey mom, bremember when I had a baby in my tummy? Me: Uh, no. I don't think that really happened. D: No bremember last time when I had that baby in my tummy? Me: No I'm pretty sure that never happened at all. D: Bremember the baby in my tummy then I fed it a bottle and he drank it all gone? Now I know some of you will try to take that as an announcement, but there is definitely no baby in my tummy. We weren't even talking about babies, or anything for that matter. See what I mean by random. I've been watching my friends kids a couple days a week and they have a cute baby girl who usually takes a nap while she's here. When she woke up yesterday Dalin was patting her tummy then told me there were crabs in her tummy. "Crabs?" "Yeah when babies take a naps they get crabs in their tummy and that's what happens." I would love to hear the thought process that leads to these bits of random, but for now I just enjoy the entertainment. Just some random photos. On elf bodies. It's the hap-hapiest time of the day! I want to tell you all up front, I really love my children. They are smart and funny and pretty well behaved (for the most part). That being said I L-O-V-E bedtime! I am almost giddy when I call every one to prayer then send them off to their dreams. We have a deal in our house. If the kids have their p.j. 's on and their teeth brushed by 8:15 they can stay up until 9:00, if not they have to go to bed at 8:30. When we started I told them it was their responsibility and I wouldn't be reminding them of the time. We've been doing this for about a year and I think there has only been three times when someone has had to go to be early, and never all of them on the same night. Last night as I was listening to all of my children bickering over some video game, I looked at the clock to find that it was 8:18. I jumped up and found that none of my children had done their bedtime prep work. Chris thought I was a little too enthusiastic when I asked them what time it was, and totally unsympathetic to their devastated faces when they realized they had missed the deadline. Tears were shed and complaints of it not being fair were uttered, but once everyone was in bed they were asleep in less than half the time it usually takes them to fall asleep. Dalin, who folded his arms and resolutely and repeatedly told me he was NOT going to bed, was out in minutes. Sweet sweet bedtime. So you know our U2 story? Scalper ended up texting his address and we've been trying to decide if we should actually pay up, or cheat a cheater. While we were thinking about it (it's been more than a few days) we got another text telling us it was bad kharma not to pay up. I think we will end up paying, not because we are afraid of kharma but because we have morals or something. Dang our honesty! I have been in a blog funk lately, and really to be honest I've just been feeling blah about everything (I thought the holiday blahs weren't supposed to happen until December). I didn't even make anything on any of my kids costumes this year. That is the first time in ten years! Sad right? But it's okay I'm coping. Our lives haven't stopped so keep reading, there is an onslaught of posts to catch us up. I'm not talking about my weight here. That is how much all the candy my kids collected on Halloween weighed. 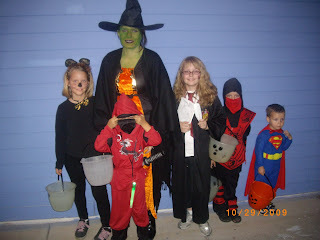 Every year we go visit our friend from Boston (who thinks our kids are wicked cute) then we go trick-or-treating in her neighborhood. It's only two blocks, but the kids filled up their buckets twice! I think it was a success. Now if I can just keep myself from eating it all. 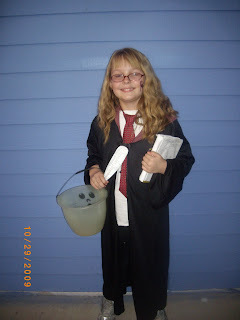 Kaylee as Hermione Granger. She made a spell book and quill pen herself. Everyone was Kung Fu fighting! 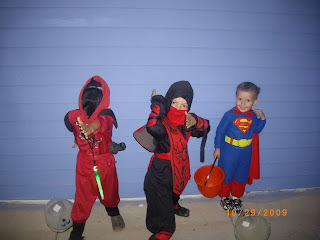 Aiden and Jayden were ninjas. That is one serious superman face! 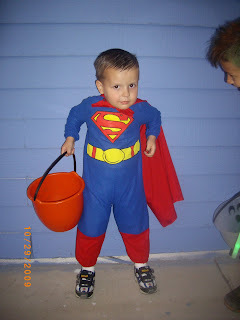 Is it a conflict of interests for superman to wear spiderman shoes? So I'm ready to tell the mushroom cut story. Like I said I had an appointment for a free haircut. I was a little nervous to start out with because I figured the people giving the free appointments were probably new hairstylists trying to build a client base. The place had salon in the name so I was trying to be optimistic. Chris had an appointment right before mine and his cut turned out great, so I was thinking it would be okay after all. A few minutes before my appointment my stylist came up to me to tell me she had to do something really quick, but that she would be right back. I realized that she didn't speak very much english and I started to panic. I could hardly explain what I wanted done, how would I communicate what I wanted when we couldn't understand each other. I hurried and found a picture of something I kind of liked and showed it to her. It was supposed to be right under my chin, but she made the first cut on my wet hair right at my chin. Once the first cut is made all you can do is hope it turns out okay. It didn't. I didn't cry, but I was not happy and I made an appointment to get it fixed by my regular stylist. Fast forward a week. After styling it myself for a few days I decided it wasn't as terrible as I originally thought. on the day of my fix it appointment I almost canceled because I thought I could live with the cut after all, but it was still uneven and needed to be tweaked a little bit. She tweaked it too much and now it looks worse than before. It looks choppy and uneven and I can only be upset at myself and my vanity. I'm going to spare myself and not put my own picture up, but to hide the tragedy I'm wearing my hair flipped up and it now looks like the mom on that 70's show (only hers looks better). 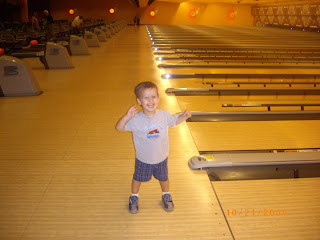 For the past couple of months Dalin has been taking a bowling class through the parks and rec. His cousin Scott and good friend Rylan took the class with him and it was so much fun. 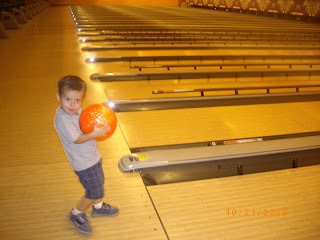 What can be cuter than a bunch of bowling three year olds? Scott and Dalin returning their shoes. Too stinkin cute! 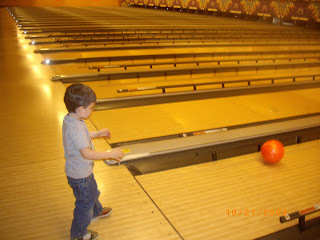 The first week the boys were really excited about the bowling. 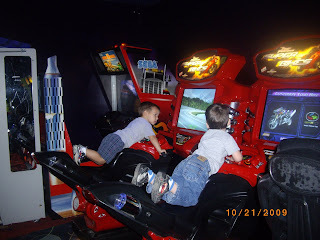 After that they just wanted to get through the game so they could pretend to play the games in the arcade. ...and 27 pounds lighter too, Happy Birthday to me! (Don't worry I know that doesn't rhyme) In April I decided I was not happy with my weight. Let's be honest I've never been happy with my weight, but April brought a sincere effort on my part to make something happen. When I started I didn't really have a goal weight, I just wanted to be less. When I started having success I decided that my birthday was far enough away that I could try and lose 32 lbs. by the time I turned 32. I am very proud of my 27 lbs., but there is a twinge of sadness that I was only five pounds away from my goal. Oh well I'll be 32 all year I'll keep trying. I am not really big on my birthday, I don't need any fuss. I really don't mind getting older (although it is a little weird that I used to think people who were the age I am now were practically at the end of their lives.) My idea of a great birthday getting a new outfit and eating my favorite kinds of desserts. So this year it has been especially fantastic because I got try on smaller sizes and have them fit! In other news, our primary program was today, and in my unbiased opinion it was our best yet. Maybe that's not totally unbiased since I wrote it, but I am always impressed with how our primary kids bring it all together every year despite our experiences at the practices. Our theme was "My Eternal Family" and our closing song was Families can be Together Forever. We had the congregation join us for an extra chorus. I was on the stand helping, so my back was to the congregation, but most of the adults on the stand were having a hard time getting through when every one joined in and I heard it was the same for the audience. There were a lot of eyes being wiped. It was pretty awesome. I think this is my 3rd birthday. How clever is my mom to have made a Raggedy Anne cake! Forget the date on the picture (or picture of a picture) It is 9/20, but the year would have been 1980. Chris had some gift certificates so we decided to go out to lunch today. 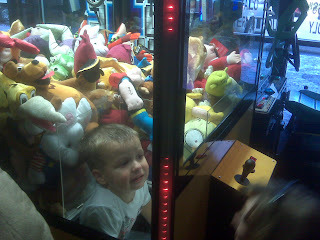 The restaurant had one of those claw machines (you know the ones with the claw that doesn't actually have enough strength to pick up any of the prizes) . 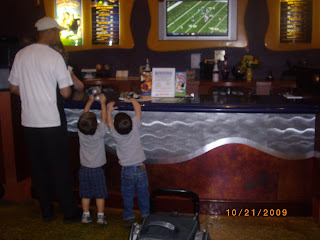 We were sitting really close to the game and Aiden, Jayden and Dalin were looking at the games and massage chairs while we were waiting for our food to arrive. 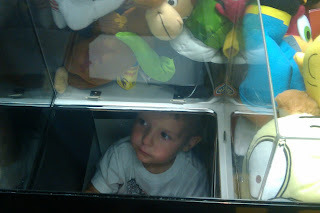 I looked over to check on the boys, and I saw Dalin standing by the claw game. After a second I realized he wasn't by the game, but actually inside of it. 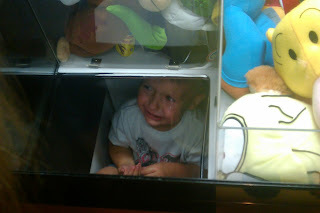 I guess there was some toy he thought he really needed so he climbed right in. While everyone else in the restaurant found it humorous I was an-gry with that boy. We tried to get him out, but the flap only went toward him and it would get stuck on his feet or legs. The manager tried to call the vendor to come unlock the machine, but he could only get his voice mail. Dalin wouldn't stand up because he didn't want the manager to be mad at him. I also think he was a little embarrassed when he saw the crowd he had drawn. Some people were suggesting that we break the door to get him out while others were taking pictures with their cell phones (they did ask permission first). 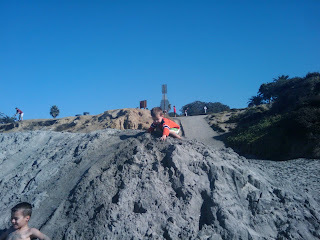 After about ten minutes Dalin decided he really didn't want to be stuck any more. I was finally able to get him to stand up and scoot back far enough to give him a little space to scoot his legs under the door followed by the rest of him. Luckily it was before the manager decided to call the fire department. He was slightly traumatized and didn't want to look at or talk to anyone. After he had calmed down I asked him why he did it he told me "Mom, you forgot to give me money so I had to get the toy myself." It really was a prime example of how he's been acting all week. I wonder how he learned to be just like his dad at such a young age. 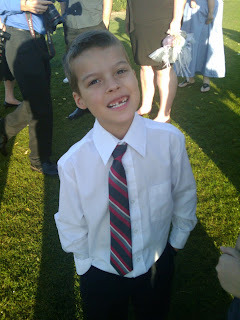 Yesterday our Aiden celebrated his 7th birthday! 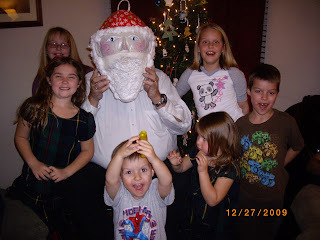 He opened presents in the morning, took cupcakes to school then we had a family party in the evening. The latest rage (among our seven year old boy) is Bakugan, and Aiden got his fair share. I tried to make a cake that looked like a Bakugan, but it turned out less than stellar but luckily the cupcakes I made with the extra batter were delicious. We had a pinata again this year and once again I went a little overboard with the candy. Unfortunately the pinata didn't make it through all of the participants, but once the fallen candy was gathered the rest of the kids were content just to hit what was left on the rope as hard as they could. Here are a few of this years favorites from Aiden. Saying: Dalin get out of my stuff! School started on Monday and even though my kids have only been out for two weeks, I was ready for them to go back. They were actually all ready early so we got there on time. As we were walking to the school I asked Kaylee and Ashton if I could give them a hug or if they were to old for that kind of stuff. Ashton said she wanted a hug but Kaylee, who was already walking about ten feet in front of us said something I couldn't hear which I took to mean NO WAY! I was okay with that though because I said loudly, "that's okay no one needs to know your mother loves you!" 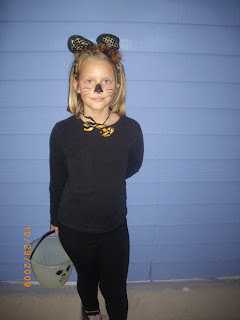 Got to love these prepubescent years (I'm sure it will only get better when she's a teenager). On the way to school Dalin kept taking his shoes off and when Kaylee told me it happened again I said that's because he's a punk. He then replied by making a spitting noise and saying, "I spit my punk out!" He sure knows how to use humor to get out of trouble. The rest of the kids thought this was hi-lar-i-ous and they have been trying to get him to repeat it all week. He's now added a warning of "watch out for my punk" after he spits it out. That kid cracks me up! I forgot to take the first day of school picture at home, so this is right after we got out of the car at the school. The girls go to a different school than Aiden (it's next door and it's grades 3-5), and they don't let the parents come into the classroom on the first day, so I only have Aiden at his desk. Isn't he too stinkin' cute! Chris had the day off on Monday and he decided we should be touristy and head out to the strip. I've lived here my entire life, and this is the first time I have ever been to the Las Vegas sign. It was a lot of walking but I think we all had fun. When we came out of the Belagio garden we had just missed the water show (my favorite thing in Las Vegas). By the time we were ready to go home nobody wanted to walk back to the Belagio parking garage (Chris took the monorail back to get the car then came to pick us up) so we didn't get to see the dancing waters. Maybe we'll have to brave the Las Vegas heat and the overcrowded strip again soon, or not so soon.